Halloween is about more than getting lots of sweet candy in your tummy. You can also enjoy games, either with your friends, family or alone. Games alone, you say? Yes! Word search puzzles, crossword puzzles and the like are excellent games to play alone, and they're good for the brain, too. So if you won't be joining in the candy collecting activities, you can at least take part in a bit of the Halloween fun by enjoying a piece of candy at home while you complete a puzzle. Here at FreePrintable.com, we have lots of puzzles and free printable games to keep you busy for hours. All you need is your printer and you're ready for fun within a couple of minutes. Try it for yourself! You don't have to be an adult to enjoy Halloween word search puzzles. They're fun activities for students, too. In fact, word search puzzles are an excellent way to improve vocabulary and spelling skills. As students find each word, they'll be engaged with it to improve retention about how the word is spelled. Vocabulary can be a separate activity, but it will certainly be one that children enjoy when the words are popular Halloween phrases. Spiders, graveyard, mummies and pumpkins are just a handful of the words that will delight youngsters in the classroom. After they complete the word search puzzle, have them design their own flash cards for spelling practice. They can draw pictures of the items on one side of the card and write the word on the other. It's a fun way to get students involved with words and phrases that they commonly hear around the Halloween holidays. Did you know that all of our printables are customizable? It's easy to add the name of a child, student, teacher or parent to the worksheet. 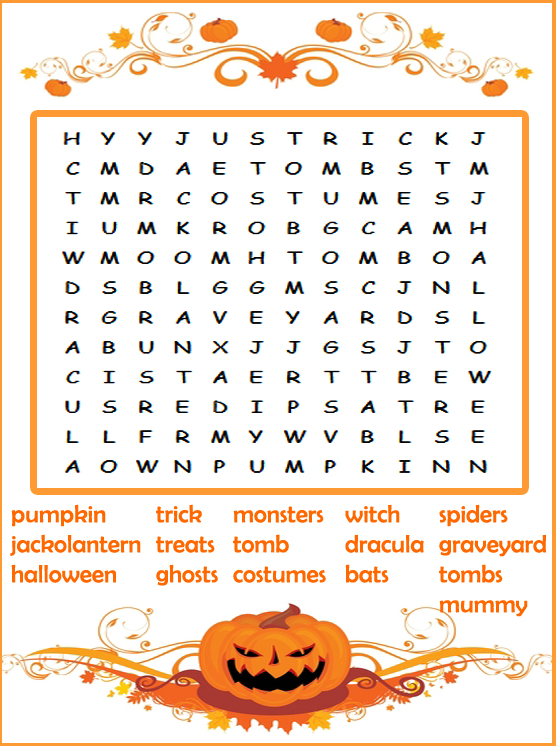 Just click on the customize tab beneath the picture of the Jack-o-lantern word search puzzle. You'll see tools on the next page for adding text, images and clip art. You can stretch, move or rotate the added elements any way you like to create a unique, one of a kind printable just for you. It's the perfect way to keep track of sheets for your classroom if you're a teacher. Not only can you put your name on it, but you can also put the semester and year in small print at the bottom so that you'll always have a reference as to when you began using it. This is useful for teachers who like to rotate material every year or two for variety. As you can see, games like word search puzzles have their place in the Halloween festivities. When children are bombarded with sweets during the last week of the month, you can have an alternative activity ready that's fun while still being educational. After all, there's only so much candy that even the sweetest sweet tooth can take!